The jokey title song (by an uncredited Burt Bacharach) is one of the memorable features of this iconic 50’s monster movie, in which 27 year old teenager Steve McQueen witnesses a meteorite landing in between tame rebellious shenanigans with his archetypal 50’s hot-rodding pals. This heralds the arrival of a shapeless, gelatinous creature that gruesomely precedes the more visceral body horrors and disease metaphors of ALIEN-era horror cinema, and influenced everything from THE INCREDIBLE MELTING MAN through to CREEPSHOW and GREMLINS. 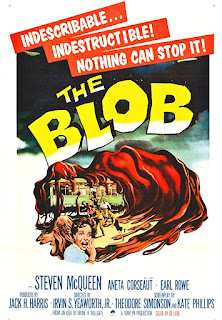 The fast-growing Blob wipes out disposable small town characters (old drunk, mechanic, doctor) while the stubbornly sceptical cops mock and blame McQueen for everything. The movie offers few hints at the monster’s origins (the only thing we know about it is that it hates the cold) and has spirited fun with a cinema set piece in which it invades the projection booth during a Bela Lugosi “Midnight Spook Show”. More pedestrian than the best 50’s monster movies, and weakened by the FX limitations of the time, it remains a lot of fun, and it’s easy to see why McQueen and his beautiful baby blues became a star soon after his role here, channelling James Dean while taking on Kevin McCarthy’s role in INVASION OF THE BODYSNATCHERS as he demands the ignorant locals to wake up : “This town is in danger!” In our doomed Global Warming era, the ending (and the ambiguous “The End?” on-screen caption) carries an extra charge with its concept of The Blob being unkillable but containable in the Arctic….for as long as the Arctic stays cold….